your next assignment is sent by email. 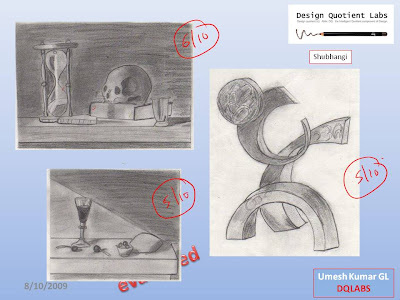 draw and submit them asap or by 30th NOV.
follow up the assignment as instructed and redraw the objects.. submit the drawings and photographs images by 23rd NOV.
1 . redo the blow sketches as per the feedback. 2. read the perspective chapter and write down 10 important features of any perpective drawing. 3. i have sent you some assignments by email. submit the mby 26th october. DAY-10. Create all the 4 perspective views for teh illustrated 3d Block. DAy 9 redo as per the feedback. redo the sketch as per the feedback. Day 7 - read the perspective chapter, understand the imp of Vanishing points, redo the assignemnt. 2. draw the given object in all 4 views. Day-6. lets go a step further now. i have sent you some assignments by email. submit them. Day 5 Correct the other 2 sketches also. Day 4- correct the books exercise as per the feedbak, take reference of the sketch alread yyou were given. try to get the depth in the sketch. dont be hesitant to use dark valued shades to the sketch.